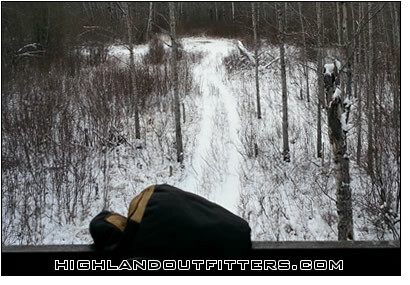 When hunting Saskatchewan in the fall, temperatures can range from 32F to -20F (0C to -30C). If you want to give yourself the best chance at harvesting a trophy buck, you need to be dressed so you can sit all day. Layering your clothing is of the utmost of importance. Do not bring just one heavy jacket. Your first layer should contain moisture wicking abilities (synthetic). Additional layers should be made of wool and/or synthetic materials such as fleece. The number of layers will depend on your individual tolerance to the cold. Bring the best boots you can with the coldest rating you can find. Cabela’s makes the “Saskatchewan Pac Boot” which is a good choice. Leave plenty of room for the addition of a chemical heat pad. Boot blankets are also a great way to keep your feet warm. For the ultimate warmth try using an old “quiet” sleeping bag. Simply step into it and pull up to your chest, locking in all your valuable body heat. A heater body suit is also a great option although not always needed. A “waist up” outer layer of solid white, yellow, red, or orange, large enough to fit over your bulky clothes, is required by Saskatchewan law. White is less noticeable to the deer and makes for better field photos as the antlers will show up better.